Europe is quite rich in finds of progressive Neanderthals from Middle Paleolithic contexts and early modern humans associated with evolved Upper Paleolithic (late Aurignacian and Gravettian). The Middle –Upper Paleolithic transition took place around 40 k.a. BP and was a one way ticket from the Mousterian to fully fledged leptolithic industries (Figure 1: eastern Gravettian tools). But Europe is the exception and not the rule, because incoming AMH had their own culture and the culture of the Neanderthals became extinct. Most archaeological concepts have their origins way back in the nineteenth century with the early developments of archaeology, such as the Three Age System, the Antiquity of Man or the principles of stratigraphic succession. Within such arguments, series of natural and cultural groupings had been organised along a linear sequence from lower to higher, from simple to complex, from primitive to advanced. The fate of individual units contained within such sequences was fairly clear; their movement was passive and one-dimensional, on an axis between regress and progress. During the last 40 years, many areas of research that are of interest to archaeologists witnessed an increasing use of yet another approach. According to this perspective, changes do not always occur at the same rate. Periods of gradual change may alternate with very rapid changes, or with time-spans in which there is very little change. We have to consider accelerations and decelerations in the rate of change, continuities and discontinuities, more chaos than logos. The processes concerned are ‘non-linear’ The investigation of non-linearity is rewarding, when we look on the Middle/Upper Paleolithic boundary of the old world. Levant: Two technocomplexes, the Ahmarian and the Levantine Aurignacian, represent the early Upper Paleolithic in the Levant. The Ahmarian is estimated to start at Kebara IV between 42-43 k.a., at Manot 45 k.a. cal BP, and is dated around 38 k.a. at Boker A in the Negev. The Aurignacian starts somewhat later for example 36 k.a. at Kebara unit I and II and at 38-34 k.a. calBP at Manot. In Umm el Tlel (Syria), levels III2a’ and II base, the “Paléolithique intermédiaire”, sandwiched between the Mousterian and Aurignacian, have been dated rather late, at 36.5±2.5 k.a. by TL on burnt flint, and at 34.5±0.89 k.a. BP with AMS dating. 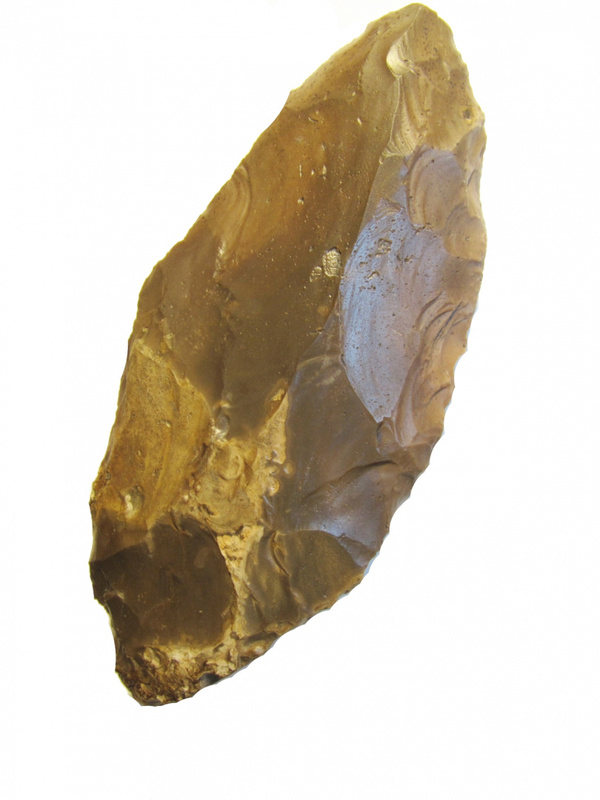 Interestingly, while the lowest Stratum can be compared with a fully leptolithic blade production, comparable with the Ahmarian, the upper strata show a modified Levallois concept and look like the Initial Upper Paleolithic, comparable with the much earlier industry at Boker Tachtit! Thermoluminescence dates were obtained on five heated flint artifacts from the Mousterian layer C1 (Moustérien tardif), at Jerf al-Ajla (Syria) giving a weighted mean of 35.6 ± 3.4 k.a. Therefore this Mousterian was present thousand of years later than the Beginning of the Upper Paleolithic Ahmarian. These observations show that in the Near East there is no linear development in lithic technologies. We have to assume a long time span characterized by the simultaneity of Upper Paleolithic industries and other technocomplexes that are “in transition” or purely Mousterian in their character. Upper Nil Valley: Lower Nubia and Upper Egypt have a relatively well understood geochronology of the Late and Terminal Pleistocene and the human occupation in the period in question: The early Nubian Complex: Figure 2 shows a foliate from this entity, roughly corresponds to early OIS 5 or even OIS 6, while numerical ages for the late Nubian Complex in northeast Africa fall in the latter half of OIS 5. Other Middle Paleolithic entities without the characteristics of the Nubian Complex, mainly based on a common Levallois technology during OIS 5 and later are known in Egypt and have been called: Local Nilotic Complex with (a) Denticulate Mousterian (K-Group), (b) Khormusan ( dated most probably to OIS5a), (c) Halfan and (d) Idffuan. A late Middle Paleolithic ensemble, dated by OSL to 50-70 k.a. was found at a chert extraction site in the Nil-valley at Taramsa 1 superimposing one early Nubian ensemble with handaxes, foliates and Nubian points and a younger one without bifacial pieces but the persistence of Nubian technology . The Taramsian is characterized by a Levallois reduction system that is transitional to the systematic production of blades.This ensemble with a changing Levallois production is not unlike the transitional assemblages known in the Negev at Boker Tachtit. The Upper Paleolithic occupation of the Nile valley seems to have been very restricted. 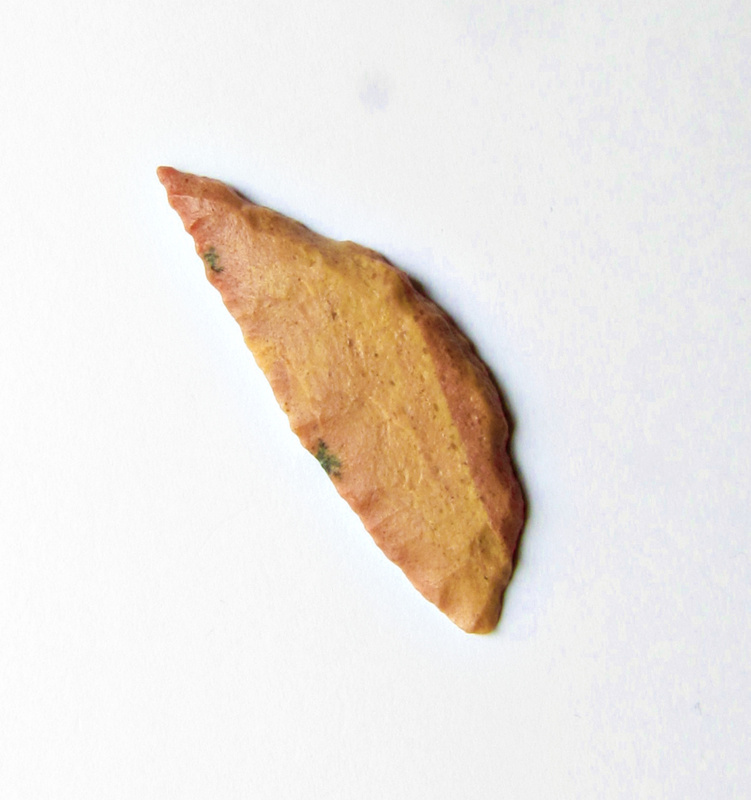 The assemblage from the nearby Al Tiwayrat is undated and might represent an early blade technology similar to the Taramsian but dated to OIS5. Other assemblages from the Upper Palaeolithic were described as Khaterian (42-30 k.a. BP; from Nazlet Khater 4 an extraction/mining site with a AMH burial sites at NK 4 and NK2) and the Shuwikhatian (about 25 k.a. BP; a blade industry with characteristic finely denticulated blades known from several small campsites). Anyhow, in the Upper Nile valley we note a clear trend from Middle Paleolithic to entities of pure Upper Paleolithic industries. But around the LGM and later, we observe again a Levallois based industries, for example the Halfan. This industry is dated between 22 to 14 k.a. BP and mainly restricted to Nubia, while further north in the Nil valley typical epipaleolithic industries were present. During the Halfan, flake and blade production were performed on single and double platform cores, by an evolved classical Levallois method for the production of thin Levallois fakes. In living sites, burins, notches, and denticulates are found. During survey in 1998–2003, on the left bank of the Nile around Affad in Sudan, many Paleolithic sites were identified. Testing in 2003 revealed undisturbed surface assemblages of lithic artifacts alongside animal bone remains. Since 2012, a research project run by the Institute of Archaeology and Ethnology of the Polish Academy of Sciences has further investigated these sites. Affad 23 is dated by OSL around 15-16 k.a. Extensive refitting of lithics in the excavated assemblage show, that most of the lithic material is in situ. At Affad 23, preferential Levallois technique was prevalent and recurrent Levallois concepts of minor importance. In addition, discoidal – flake oriented methods were common. Research in Affad-23 also yielded abundant evidence of small features such as postholes, pits and hearths which clearly indicate the extensive use of lightweight structures intended, for example, as sun shields and frames for the drying of meat; hearths were typically located outside the clusters of postholes. Even though patterns which could reflect the form and size of individual structures are not easily discernible within the plethora of cut features at Affad-23, their presence indisputably attests the existence of various constructions. Moving to East Africa, the end of the MSA in this region was apparently a gradual and complex process rather than a a single event, with the emergence of the subsequent LSA developing from local MSA roots. At Enkapune ya Muto, Kenya, the sequence from ∼40 to 55 k.a. shows a basal MSA horizon with Levallois and discoidal methods of flake production and rare backed pieces. 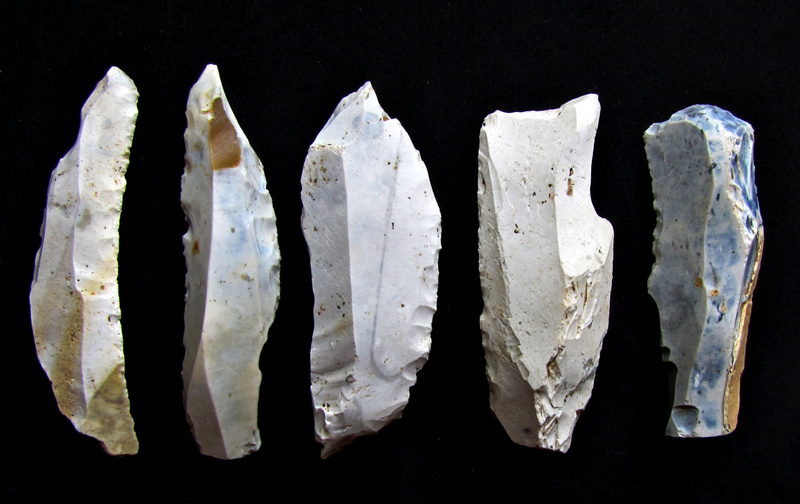 It is overlain by an industry attributed to the LSA dominated by the production of large (∼7 cm) backed blades and microliths, which is in turn overlain by an industry with abundant microliths (∼2– 5 cm), MSA-like core reduction strategies, and ostrich eggshell beads. In contrast, at Mumba Rockshelter, Tanzania, the stratigraphic sequence suggests a gradual change in the frequency of typological and technologically important artifacts. Backed elements persist in low numbers across multiple strata, coincident with a reduction in the frequency of Levallois cores and points and an increased use of bipolar percussion for flake production from ∼30 to 68 k.a.. The nature of the change is such that the MSA or LSA attribution of a number of industries at Mumba is uncertain. Figure 3: Large backed piece from an MSA context. Similar combinations of typically MSA (e.g., points) and LSA (e.g., backed pieces) artifacts are found at the Mochena Borago in Ethiopia . Goda Buticha is a newly discovered cave site in southeastern Ethiopia, containing MSA and LSA cultural material, faunal remains, beads, and human skeletal remains. On a macroscopic level there is a complete absence of indications for post-depositional mixture. A 2.3 m-deep sedimentary sequence records two occupational phases separated by a sharp chronological hiatus, in the Upper Pleistocene (ca. 43–31.5 k.a. cal BP) and in the mid- Holocene (7.8–4.7 k.a. cal BP). 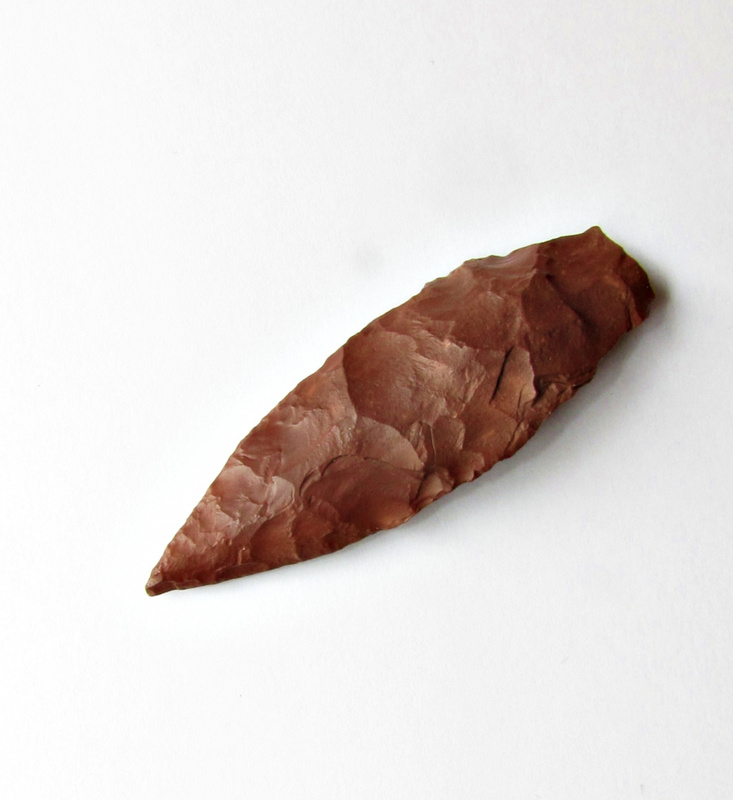 The lithic assemblage at the base of the sequence is clearly MSA, with Levallois production, unifacial and bifacial points, associated with a microlithic component, very similar to the MSA of the nearby Porc Epic cave, which may be somewhat older (about 50 k.a.?). The overlaying Holocene assemblage contains diagnostic artifacts (backed microliths and bladelet production), with ubiquitous use of obsidian and MSA elements that appear in the Holocene. Recently, Scerri et al. reported typical Middle Stone Age (MSA) technology at Ndiayène Pendao, Lower Senegal Valley , dated around the Pleistocene/Holocene transition, at ~11.6 ka. The ensemble consists of core axes, basally thinned flakes, Levallois points and denticulates mostly made from chert. Similar technological features characterize several, larger surface sites in the vicinity. Figure 4 and 5 show MSA foliates of unknown age from the Libyan desert.